The dairy goat is a major agricultural commodity these days, but it hasn't always been that way in the United States. Only recently has a market existed that warranted large-scale production of goat dairy products. More than half of domestic dairy goat operations are primarily for personal consumption and not as a source of production income. 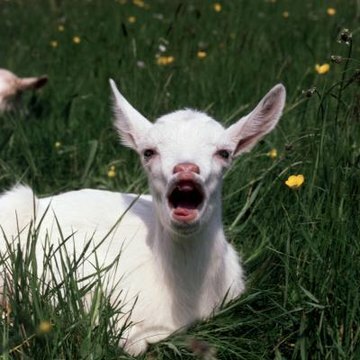 Goats were introduced to North America in the 16th century by Spanish colonists. For hundreds of years the humble Spanish goat was a source of milk and meat, but goats did not become an agricultural commodity the way sheep, cattle, pigs and chickens did. Many of the original Spanish goats became feral and populating parts of what would become the United States. For most of United States history, dairy goats were utilized by small family farms as a personal source of milk cheese. During World War II, dairy goat production picked up as a component to Victory Gardens. Dairy goats operations in the United States favor six major breeds. The LaMancha breed is one of the most popular breeds for dairy production and also has the longest history in America, being descendants of the original Spanish goats. They are easily recognizable by their short ears, which lack external cartilage seen on other goat breeds. Other breeds were introduced to the United States beginning with the Saanen, a breed from Switzerland, which was introduced in 1904. The other common dairy breeds in the United States are Nubian, Alpine, Toggenburg and Oberhasli. In the early 1930s goat milk started to find a market as an alternative dairy product for those who had allergies to cows' milk. The Jackson-Mitchell company became one of the first operations to produce goat milk on a commercial scale, stocking drugstores across the country. The next step in the evolution of the dairy goat industry came in the 1970s, as a back-to-earth movement began to take hold. The goat became a perfect farm animal for homesteaders who embraced sustainable agricultural practices: Goats do not take take up as space or require as much feed as cattle. Along with the primitive-living movement came an increased demand for healthy and natural foods, which goat milk products are frequently marketed as. By the 1980s, goat milk and goat cheeses were sought by connoisseurs as gourmet items. The dairy goat industry has continued steady growth since the 1980s. Goat milk and soft goat cheese, commonly known as chevre, is available in most supermarkets today. As of 2013, 360,000 head of dairy goats were counted in the United States. More than 30,000 farms in the country raise milk goats. In addition to a variety of different cheeses, goat milk is used to make yogurt and even ice cream. It often serves as feed for other animals.